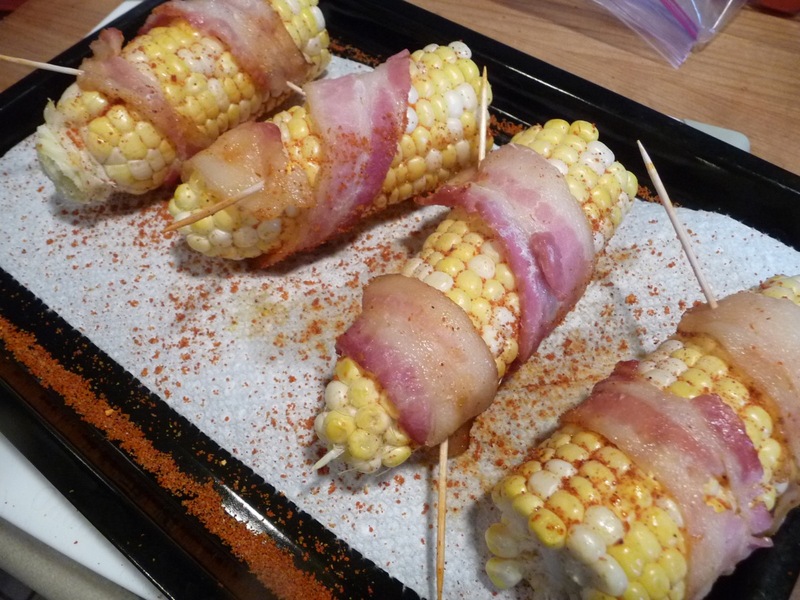 I was inspired by a post from Chris Grove on NibbleMeThis.com to do the bacon wrapped grilled corn. I chided Chris for not posting any details about the corn itself on his post, and after a quick phone call, I knew I was on my own. (He did mention something about a BBQ rub). Thanks Chris. 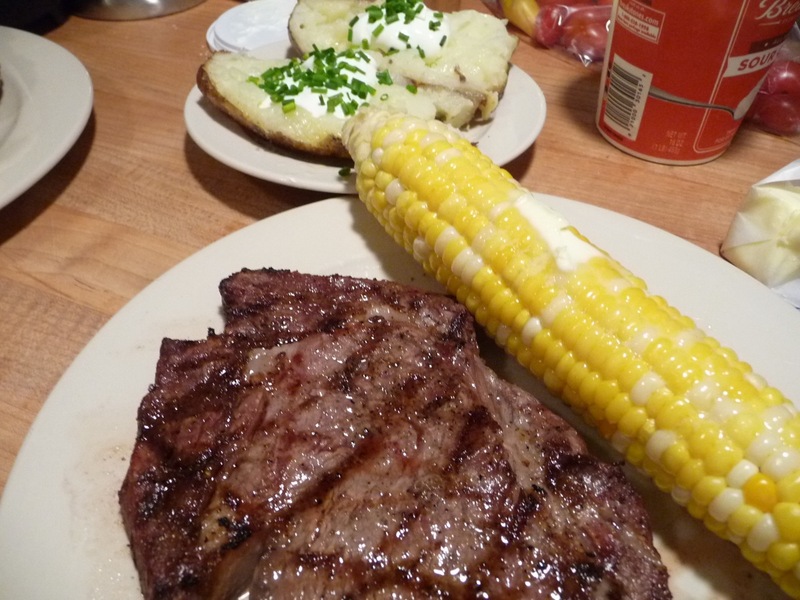 Of course I knew I had to have something to go with it, so, ribeye steak was the obvious choice. The baked potatoes were a given. Marilyn makes the best. 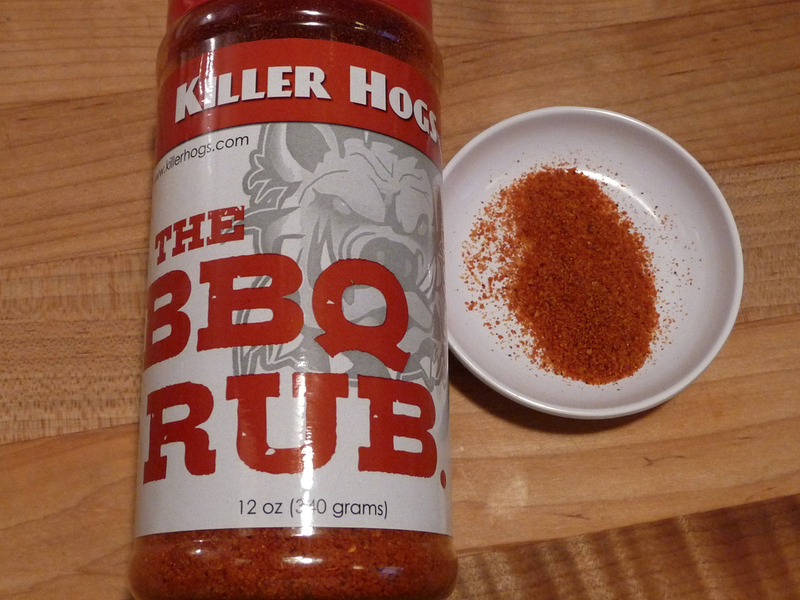 Killer Hogs The BBQ Rub: Ingredients: brown sugar, sugar, salt, paprika, spices including chili pepper, evaporated cane juice, dehydrated garlic, and orange peel, onion powder, monosodium glutamate, mustard flour, extractives of paprika (color), dill weed, turmeric (color) and natural flavor. 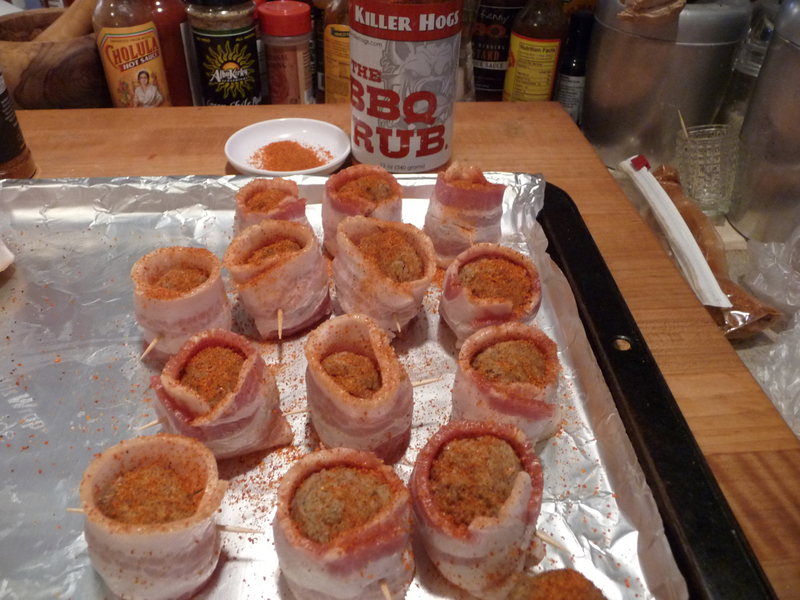 We tried Killer Hogs BBQ rub on some MOINKBalls and on ribs. 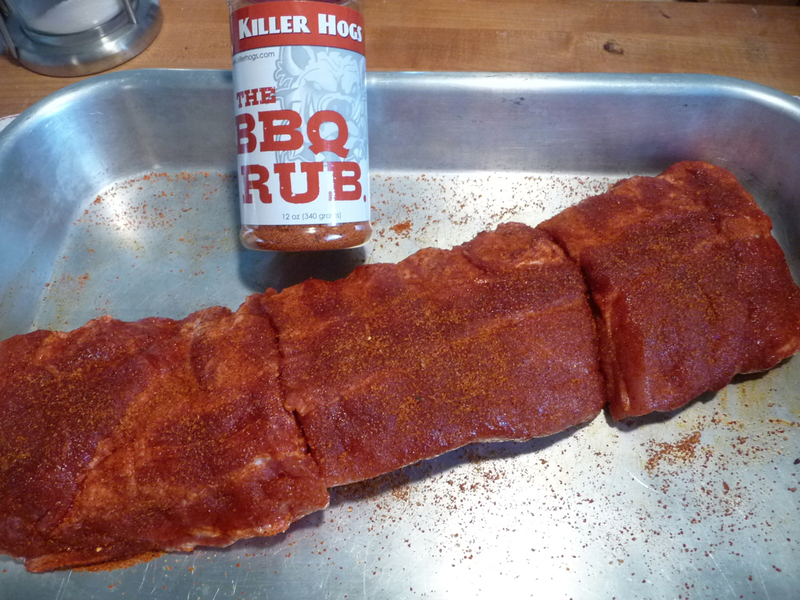 We’ve not posted a review yet, but this is an awesome, sweet, all purpose rub. We did par-cook the bacon in our small convection oven for about 10 minutes. We wrapped each “niblet” with one slice of bacon. 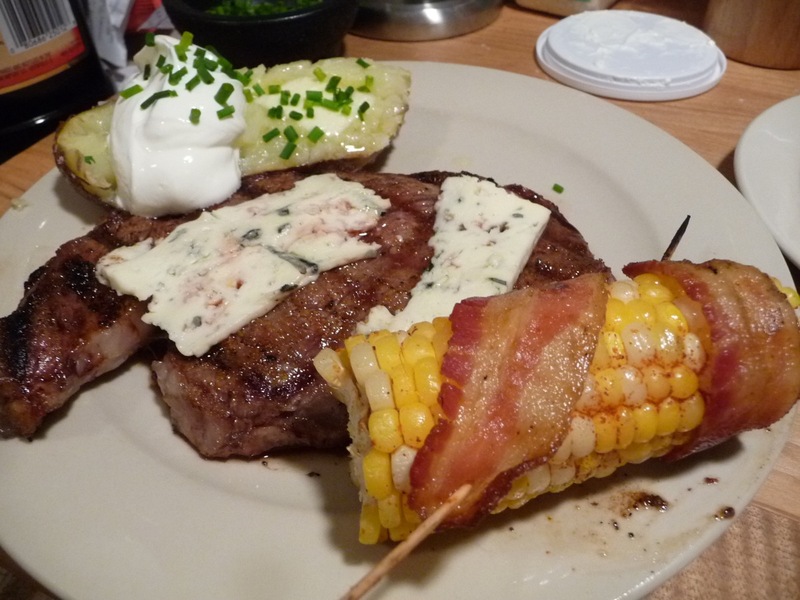 Next time I will allow for 2 strips of bacon to wrap the niblets of corn. The Reynolds Wrap Grill heavy duty non-stick foil is made for grilling… with a dull side of the foil that you place food on, for non-stick reasons. It’s even labeled as the non-stick side. Pretty good stuff, although just a bit thinner than your standard Heavy Duty Foil. 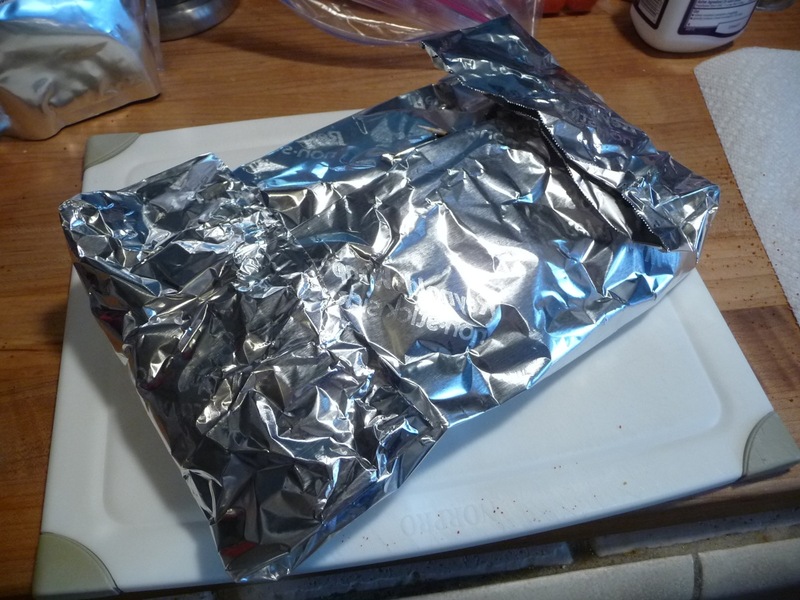 There’s another shot of the same foil with the corn inside the packet, non-stick side in. 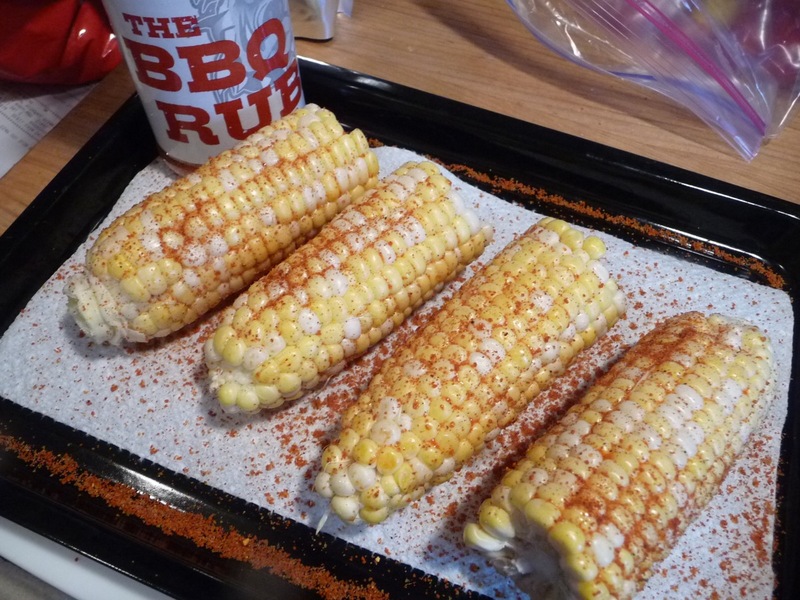 The corn cooked in the foil, indirectly, for about 20 minutes before we placed it on the grill grates. 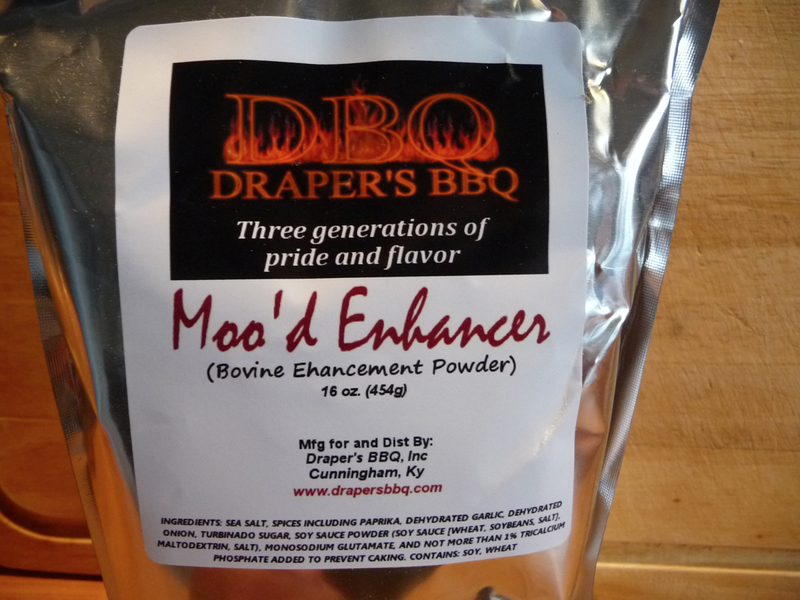 Draper’s Moo’d Enhancer was my seasoning of choice for my ribeye steak. 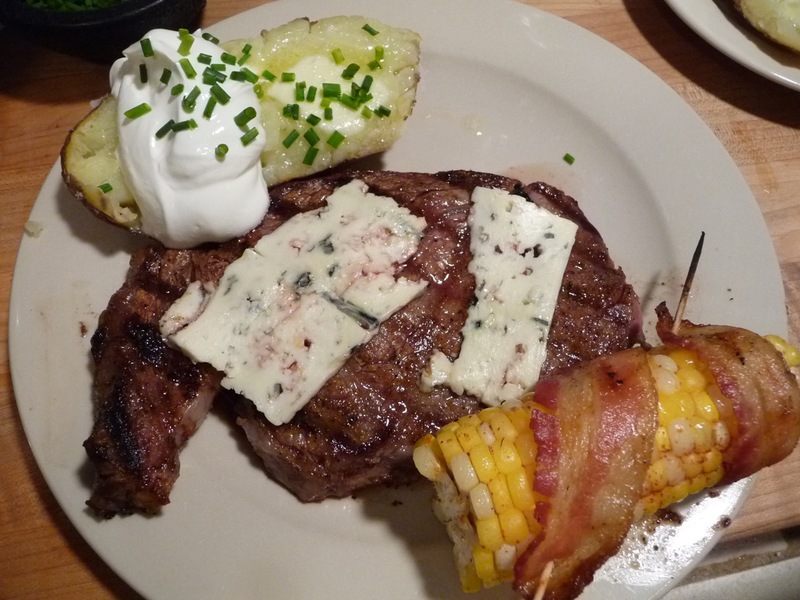 We reviewed Moo’d Enhancer here. 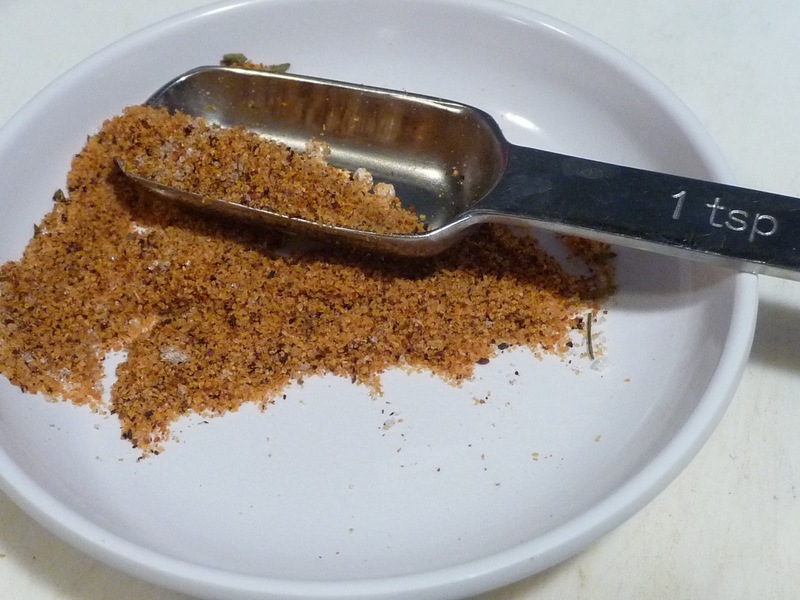 My steak was only about 1 lb, so I decided to go conservative, and only use 1 tsp of the rub. Next time I will double that. 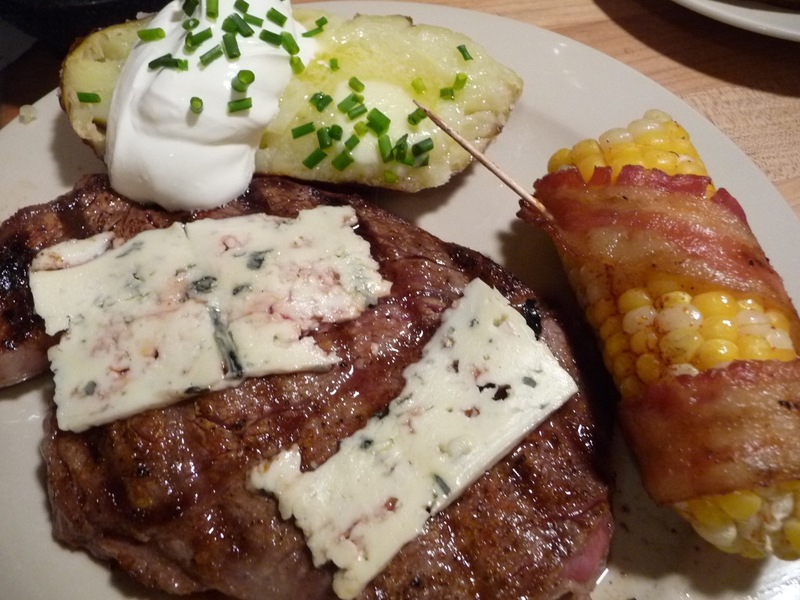 Here, our steaks are ready for the grill. 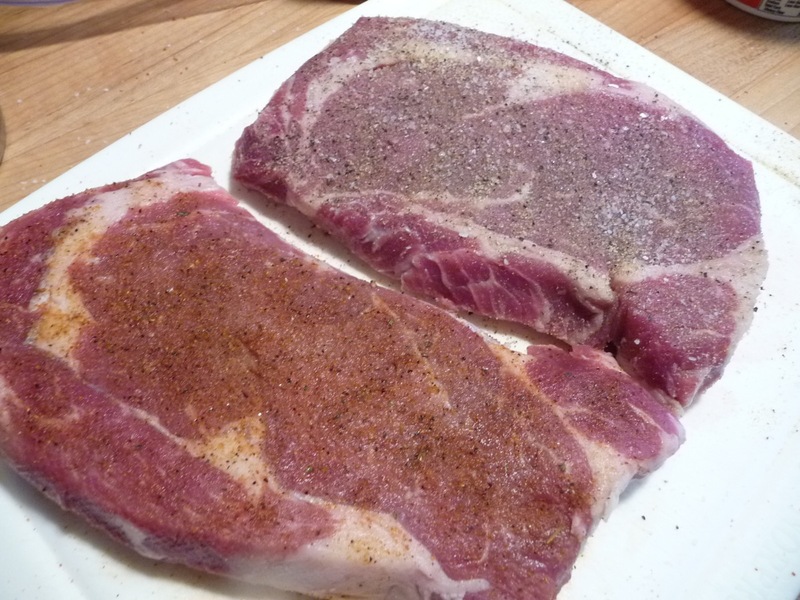 Marilyn’s steak on the right, has her classic (and delicious) blend of salt, pepper, and garlic powder only. The baked potatoes had already been par-cooked in the microwave to get them ready for the grill. A little oil (canola) and coarse kosher salt, and off they go. Everybody into the amazing pool, installed by the pool installation toronto team! 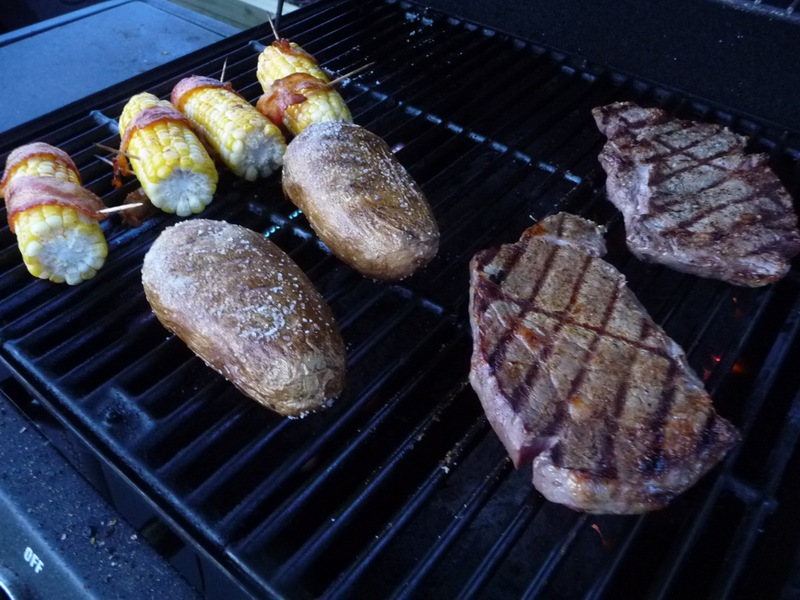 (Nice grill marks). All done. Ready to eat. The bacon was delicious, savory and sweet, and had a nice “bite”. Here’s a case where the bacon got some sweetness from the corn. I should have hit it again with the rub. 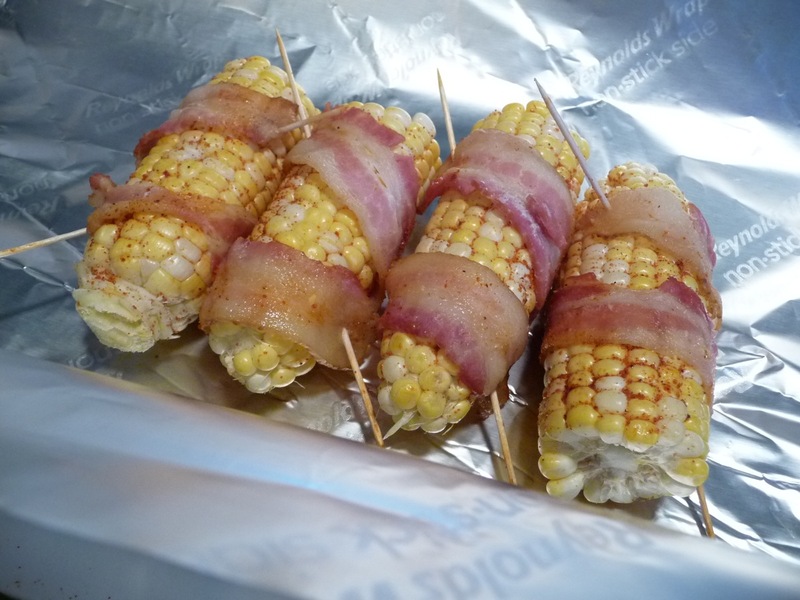 The corn got a salty smoky flavor from the bacon. It’s a win – win situation. 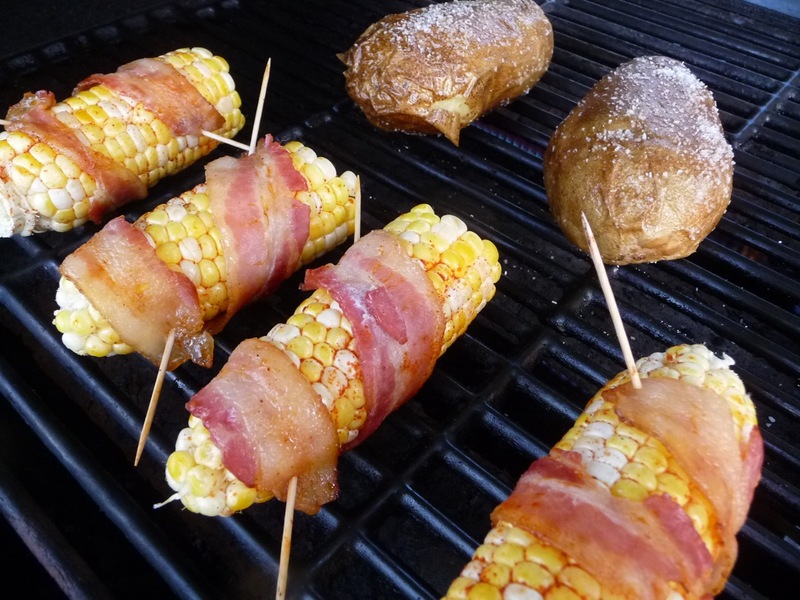 Have you wrapped bacon around grilled corn on the cob? What’s the weirdest thing you’ve put bacon on? Let us know in the Comments below!